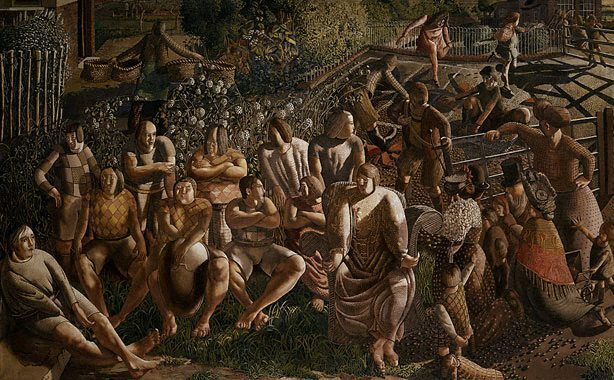 Stanley Spencer's [religiosity] was marked by an almost mystical fervour. His understanding of Christianity had a pantheistic overlay that allowed for the incorporation of his own wilful and eccentric imaginings. Eroticism was an area of human experience to which Spencer's art gave uninhibited expression, though this incident-filled composition is comparatively chaste. A Christ of Romanesque solidity presides over workers, village worthies, children and most of the local football team. The setting is a cottage garden in Cookham, Spencer's rural birthplace which he habitually portrayed as an earthly paradise. Part of a series of canvases executed for the Church Home, 'Christ in Cookham' recalls the fastidious images of the Pre-Raphaelites. In this collection it can be usefully compared with Ford Madox Brown's 'Chaucer at the court of Edward III', painted a century earlier. [Spencer] saw in the structures of English society the worldly articulation of a godly plan. This work is from the series 'Pentecost Last Judgement' intended for the Church-House.